Have yourself a Merry Little Dovecraft Christmas Pudding die! Honestly, this die will come in so handy during the festive holidays and Maxine is going to show you how diverse this one little pudding design can be! Read on to find out how to create the sweetest wine glass tags and a few other goodies with this Dovecraft die! 1. Die cut the Dovecraft Christmas pudding die onto white, brown and green First Edition Textured Card Stock. 2. Adhere the brown die cut to a piece of First Edition Red Textured Cardstock and cut out. 3. Take the white icing die cut section and stamp your chosen name with the Simply Creative Alphabet Stamp set. Adhere to the brown die cut with glue. Cut the leaves off from your green die cut and adhere it to the top of your pudding. 4. At the top of your die cut, create a hole using a Fiskars punch. Thread through a length of twine and a few Simply Creative Jingle Bells. 5. Now your tag is ready to be tied to your wine glass! How sweet are these wine glass tags? The perfect addition to any Christmas dinner! Your family and friends will love the thought you’ve put into personalising their glass. You could also die cut a selection of Christmas puddings, adhere pegs to the back of each and thread through a length of twine. This would act as a wonderful card holder throughout the holidays! Or you could create a festive tag to adorn your presents! Your friends won’t want to throw away the wrapping when they see how much effort you have put into their gift. 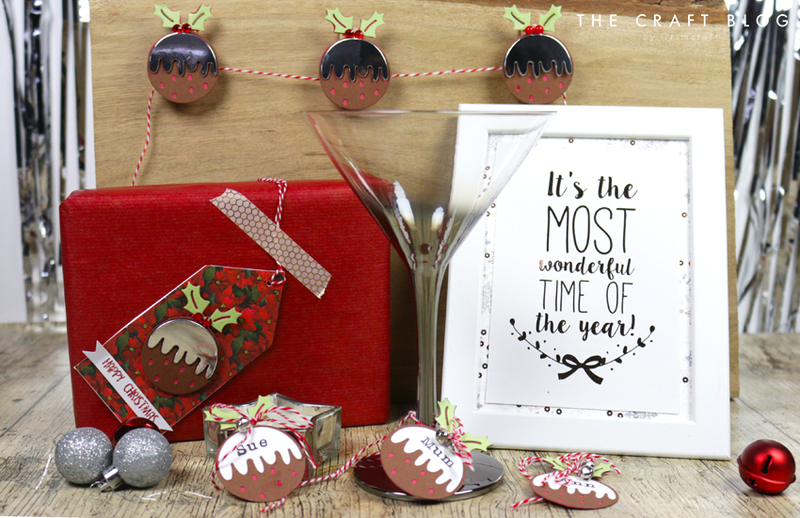 How will you use the Dovecraft Christmas Pudding die? We’d love to see so don’t forget to #trimcraft when uploading to social media and to share your projects in the Inspiration area! Fabulous die... must try and get hold of and soon! !